Using Data to Predict Fate: Future Insight or Folly? Data that can predict future outcomes has the potential to impact society by improving social services, medicine, and law. How should we use such data? What are the limitations? What are the risks? This upcoming Harvard Mind Brain Behavior panel will discuss the promise and challenge of predictive data. CLBB Co-Director Dr. Judith Edersheim is a featured panelist, and Faculty Member Dr. Joshua Buckholtz will moderate the discussion. This event will be held on February 9, 2017 in Harvard University’s William James Hall, B1 (33 Kirkland Street, Cambridge, MA), from 5:45-6:45 pm. A reception will follow the event. More information can be found here. 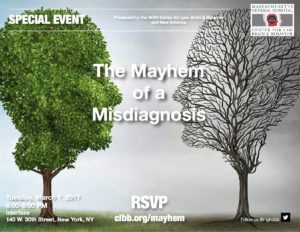 This event is sponsored by the Harvard Mind Brain Behavior Interfaculty Initiative.